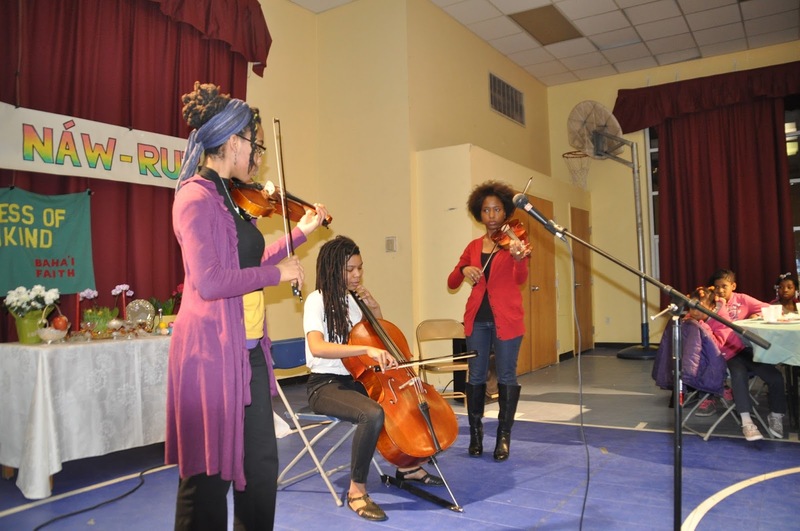 Mixed families often double their holidays. Which means the culinary options are rather excellent. I grew up the daughter of a German mother who still makes hundreds of beautiful cookies each year. I have learned to bake some of these cookies, but I can’t hold a candle to Mom. My father is from India, where most people don’t celebrate Christmas, and the majority of homes don’t have ovens. A typical Christmas dinner dish for us, growing up, was chicken biryani. But I believe there is one Indian delicacy with the power to satisfy like a cookie can. This treat is crunchy, sweet, salty and as spicy as you’d like. I call it Masala Nuts. In India, you’ll find a man on a street in any village or town or city roasting nuts in a big steel pot set over a wood fire. The roasted nuts are tossed with spices and a bit of sugar. Everything’s poured into a small paper holder and handed off to the salivating customer. In the West, you can visit a South Asian store and buy a factory made “hot mix” coated with heavy spices, oils and preservatives. They’re not terrible—but they’re nothing like the real masala nuts. At Christmas, I’ve begun to make my own spiced nuts. Savory nuts are welcomed by people who don’t want as much sugar as a cookie or cake contains. Pistachios, almonds, walnuts and their near cousins are recommended anti-inflammatory foods high in good fats. They are great at cocktail parties and also used anywhere else you’d put very special nuts: a salad, oatmeal, and rice pilaf. There are probably as many recipes for spiced nuts as there once were princely kingdoms in India. The diversity of nuts must be credited to Moghul invaders of the 15th century, who brought their plants and culinary traditions. 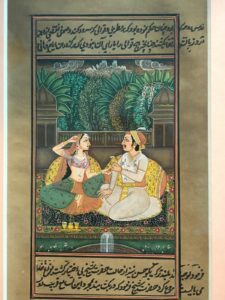 Nuts such as almonds, pistachios and cashews began decorating rice dishes and were incorporated into curries and sweets and even beverages. Who knows if the royal couple in this small painting I bought in Rajasthan are sharing a goblet of wine? It could also be a creamy punch with ground almonds or pistachios. The ultimate joy of making masala nuts is they don’t take a lot of time during a busy holiday season. 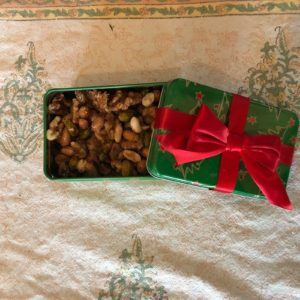 I can whip up seven gift-sized portions of spiced nuts in about 45 minutes if I use a microwave. Yes, a microwave. 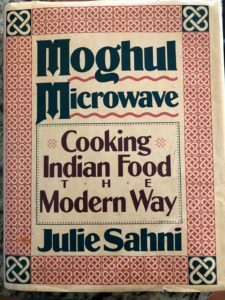 The genesis of my spiced nuts comes from Julie Sahni’s 1990 cookbook, Moghul Microwave. The book has 5 different recipes for candied or roasted spiced nuts. In the 25 years I’ve had the book, I’ve found one recipe that is my favorite, and I’ve tweaked it a little bit. For instance, I’m not a fan of kala namak (black salt), so I skip it in my version. This year, I threw some chia seeds into the dry spice rub. Chia seeds have no flavor, but they have a slight crunch that reminds me of kalonji seeds—Indian black onion seeds. And I like adding more Omega 3 fatty acids to make up for the fact there is a bit of sugar coating the nuts. *If you can’t find amchur, substitute 2 teaspoons of fresh lemon juice. Combine the lemon juice with the water, rather than the dry spice rub. Arrange nuts so they lie flat on a microwave-safe pie plate. Roast uncovered for 3 minutes 30 seconds, or until the nuts are lightly browned and puffed. You can stir them once during the process. Take out of the microwave and let them stand. Mix all the spices in a small bowl and reserve this dry spice rub for later use. Mix the water, sugar and optional lemon juice on a glass or ceramic pie plate or casserole dish. Cook uncovered for 2 minutes 40 seconds, stopping the microwave to stir twice. You will end up with a thick syrup. Add in the nuts and continue cooking uncovered for 45 seconds to one minute, or until most of the syrup is absorbed into nuts. Transfer nuts to a sieve held over a sink and drain off the excess syrup. 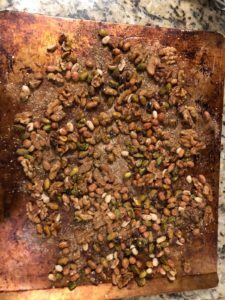 Spread nuts onto a cookie sheet. Sprinkle spice rub a little at a time over the nuts and mix, turning and tossing, until nuts have an even coating of the masala. Keep stored in an airtight tin for up to six weeks, in fridge for six months, and for a year in the freezer. It seems like yesterday, but it was last summer. I was dutifully working on edits when I got a surprising email. My editor, Juliet, had informed me about a Christmas mystery short story anthology scheduled for October 2017. Soho Press authors writing mysteries set in different parts of the world had turned in their contributions a year earlier—but there was enough room to add one more story. Did I want to submit something? I thought about it for a few days. Short story crime fiction is more terrifying a process to me than novel writing. It means grabbing an idea and introducing suspects, motivations and various twists and turns within the space of a few thousand words. While there are many writers—including right here, amongst my Murder is Everywhere comrades—who can dash off a short story in a day or two, I find the process of writing a story takes months. And when I’m done, the story is always longer than the guideline. If the average writer can take ten words to say something—I’ll use twenty. I had to ask myself—how can I afford the time to write a short story? And would it really be good enough to go in the collection? 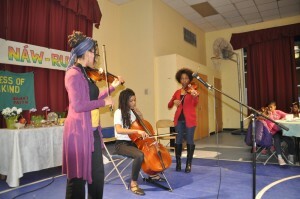 The formidable lineup included our very own Cara Black. 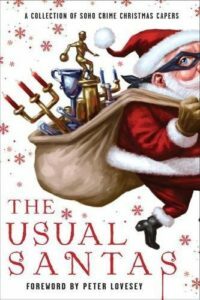 And speaking of lineups, the book’s title was coy: The Usual Santas. I really wanted to do it. And despite my slowness, I had an idea. Like many writers, I have built a graveyard of rough drafts inside my computer. I had a full draft of a story featuring my new mystery heroine, Perveen Mistry, Bombay’s first woman lawyer. She’s a Zoroastrian living in a city filled with others like herself—as well as Hindus, Muslims, Sikhs, Jews and Christians. 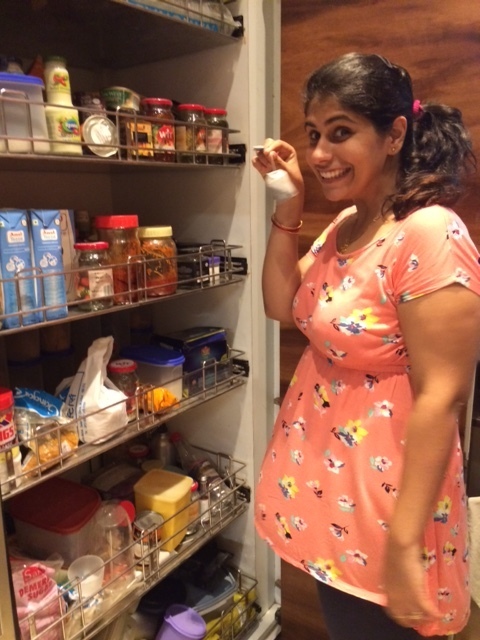 My story was almost there—but not quite. Could I “Christmas up” the story and meet the 4 week deadline? There’s nothing like a deadline to get the juices flowing. And the fact was that Bombay in 1921 was a place rich in spiritual interchanges. My story draft was inspired by the history of the Theosophists, a group of European, American and Indian seekers who had interest in shared mystical roots of world religions. The movement was divided into competitive factions in the early 20th century. 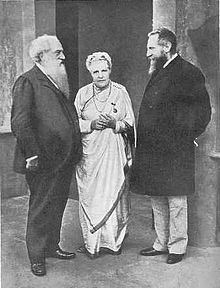 It was also led by two strong women: the first, Madame Helena Blavatsky, was a fascinating Russian expatriate who settled in India, and the second, Annie Besant, was an Irishwoman who worked alongside Indians resisting British rule. Inspired by these folks, I created a fictional group of international thinkers called “Realists” for my story titled “Hairpin Holiday.” My heroine, Perveen Mistry, is just an everyday lawyer working in her family firm. She has to make sure her client, a Jewish hotelier, does not suffer any losses during their controversial lecture booked into his hotel ballroom—at the same time as the Asiatic Society’s swinging Christmas party. Of course, the problem is more than a contract. And yes, Father Christmas makes a brief showing! The cover has sparkly red letters—perfect for Christmas! When the handsome, 400-page collection of 18 stories was published a couple of weeks ago, I received my complimentary copies. I opened it up to smile at funny endpapers featuring caricatures of a number of us. Even one of my dogs—the gentleman beagle Charlie—made it into the drawing! We had been asked by the artist what we usually have in our hands. Cara chose her cappuccino cup, and I carry a dog leash. I was fascinated by Cara’s story, “Cabaret Aux Assassins.” Without giving too much away, I’ll hint that it’s a epistolary mystery that has something to do with both Sherlock Holmes and the Dreyfus affair, and the tale is set in Paris of the 1890s. There are terrific stories by more writers you may already know: Stephanie Barron, Henry Chang, Gary Corby, Colin Cotterill, Timothy Hallinan, Mette Ivie Harrison, Teresa Dovalpage, Line Kaaberbol and Agnette Fries, Martin Limon, Helene Tursten, Mick Herron, Ed Lin, Stuart Neville, Tod Goldberg, and James R. Benn. And the inimitable Peter Lovesey, who also wrote the foreword. Read our starred Publishers Weekly review—and enjoy a taste of a December, bright or bleak, all around the world. Psst! 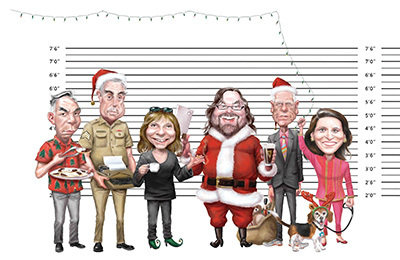 Several terrific bookstores will holding holiday parties this December 2017 where you can get The Usual Santas signed! The raft of participating authors at these book parties is a mystery still unfolding—but I’m gonna leak to you that I will be among them. Check with McIntryre’s Books in North Carolina and the Mysterious Bookshop in New York. And watch my website for more details of the Santa parties as they emerge. Another Excuse for a New Year’s Party! A few decades ago, when I was on a father-daughter trip to India, I came fact to face with my future. Not my sweet husband (although plenty of people I met on that trip offered to find me one). 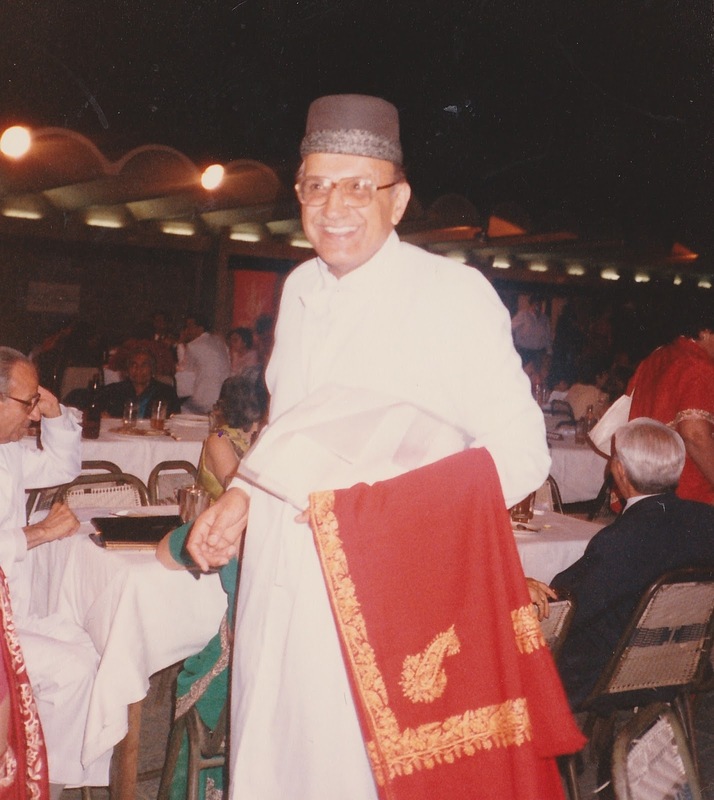 That fateful evening in March, 1989, I suddenly found myself in the midst of a party celebrating Navroze, or the Persian New Year, a major spiritual and social occurrence based on the spring equinox. 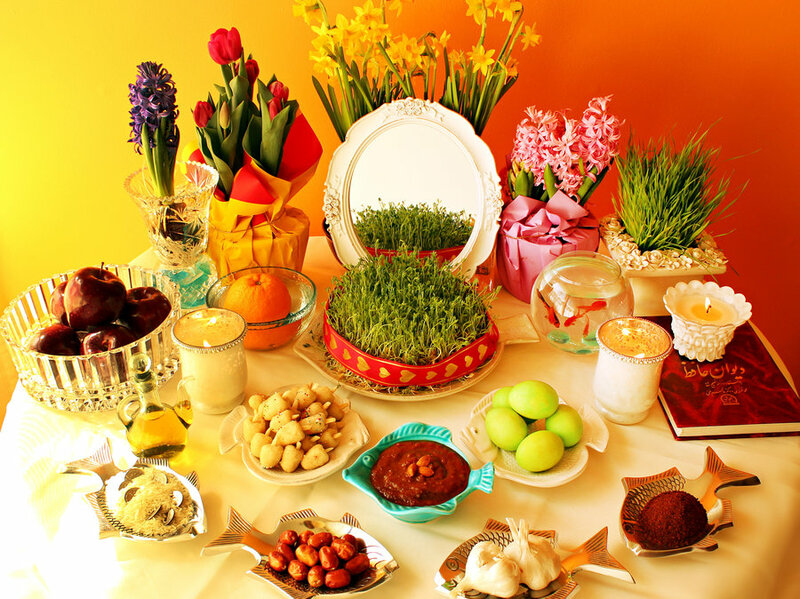 Nowrooz, Navroz, Navroze, Naw-Ruz, Nowroz, and several other spellings all mean “New Day” in Persian. This is the date that changes slightly every year: when the length of sunlight equals night. It is the start of the lunar calendar calculated by Persians about three thousand years ago. In those days, the state religion was Zoroastrianism. However, it seems that anyone whose ancestors spent time in Iran, whether Zoroastrian, Muslim, Baha’i or Kurdish, observes this new year. Some communities celebrate three days…others almost two weeks. I knew none of this going in. That long ago evening at the India International Centre in New Delhi. I was strolling about, killing time until the dining hall opened and my father and I could get something to eat. I drew near a splendidly decorated pavilion. I felt I were gazing into a magic world. 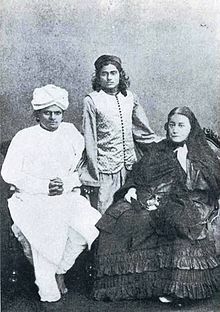 Darling little girls wore white lace frocks, ladies were draped in luxurious saris and all the gentlemen were clad traditional white suits with unusual headgear (Later I learned these were lacquered turbans called fetahs). I admired the scene until a kindly elder insisted I join them. I had my first rapturous taste of spicy, sophisticated Parsi food (Parsi transliterates to “Persian” and refers to the Zoroastrian immigrants who arrived in Gujarat starting in 600 AD). My first taste of Parsi hospitality must have been auspicious, because many years later, I find myself revisiting the March New Year in fictional form. 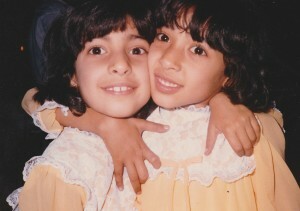 I’m currently writing a novel starring a Zoroastrian family in 1920s Bombay. Just last week I was writing about the rigorous house cleaning that before the New Year. There’s a lot to it! My friend Perzen Patel, aka the Bawi Bride, is a Parsi caterer and food blogger in Mumbai. For Perzen, the Persian New Year means a lot of family visiting and a tremendous amount of cooking for friends and customers. Several weeks before the holiday, she sent this enticing email to her friends and blog followers, and customers. This year to bring in Navroze I thought we’d go the extra mile and really create a menu that is beyond the ordinary. So, I’ve put my thinking cap on and planned a lovely special that you can avail any day from Saturday 19 – Monday 21 March. All of this yummy food for the special price of ₹1550 per plate including delivery with each plate as a whole enough for two people. Translation: that’s about $25 for a New Year’s feast for two! If you’re curious, try Perzen’s custard recipe highlighted above or the many delicious home recipes on the Bawi Bride website. Perzen says that if the celebratory Navroze meal is home-cooked (which is typical), at least one fish dish would be included for good luck. There might also be a nougat sweet, Gaz, imported from Iran. Perzen’s favorite non-culinary part of the holiday is the Haft Seen table laid out with seven lucky edibles that start with the “S” sound in Persian. These range from sumac to apple and garlic and herbs. A key item on the table is the mirror, placed there so visiting relatives can look into it and reflect on their past year and any blessings. 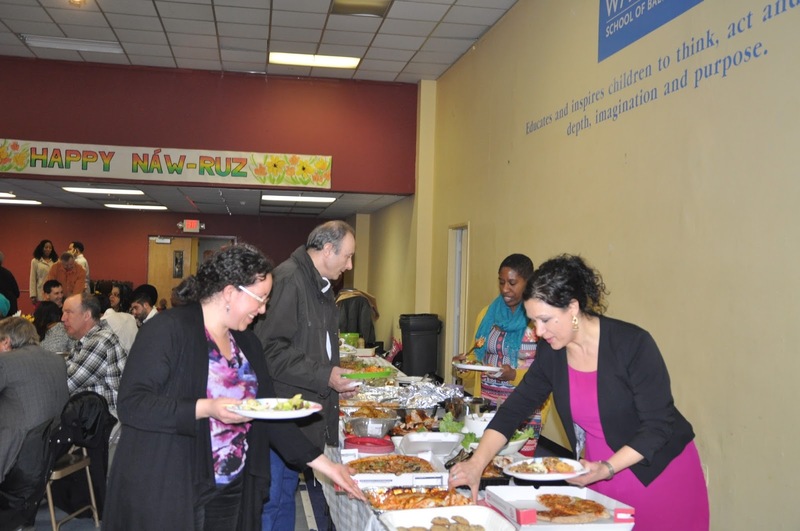 This year, on March 19, more than 200 Baha’is and their friends gathered to enjoy food, song, and prayers. Life will always get better. Naw-Ruz Mubarak!